A 53 year old woman presented in October 1987 with a several week history of dyspnoea and left sided pleuritic chest pain. A chest x ray showed a left sided pleural effusion, cytology of which showed reactive mesothelial cells. The effusion recurred in January 1990, prompting bronchoscopic and thoracoscopic examinations. The broncoscopy revealed no abnormalities but the thoracoscopy showed thickening of the pleura at the left lung base. After a pleural biopsy, a diagnosis of metastatic poorly differentiated non small cell carcinoma was made. The patient received six cycles of cisplatin/carboplatin and responded well. However, in 1994, computed tomography revealed a small tumour in the right kidney which was suggestive of renal cell carcinoma. It seemed likely that this tumour was the source of the pleural metastasis, but no further treatment was given because of the lack of symptoms, apart from exertional dyspnoea. In October 1996, the patient presented with increasing dyspnoea, anaemia (haemoglobin 7.4 g/dl) and microscopic haematuria. Colonoscopy showed several small polyps within the ascending colon, but mucosal biopsy samples revealed only inflammation. In February 1997, computed tomography showed nodular pleural thickening at the left lung base, with several tumour masses infiltrating the adjacent lung parenchyma; however, there was no change in the renal tumour. In May 1997, the patient developed abdominal pain and rectal bleeding. Repeat colonoscopy showed that the polyps were now ulcerated, but targeted biopsy samples again showed only inflammation. A right hemicolectomy with terminal ileectomy, and a right nephrectomy were performed to control the bleeding and to establish the pathology of the colonic polyps and the renal mass. Histology of the renal tumour showed a typical renal cell carcinoma. Nine small sessile polyps, the largest being 2.5 cm in diameter, were found in the ascending colon (fig 1A), with one small sessile polyp in the terminal ileum. 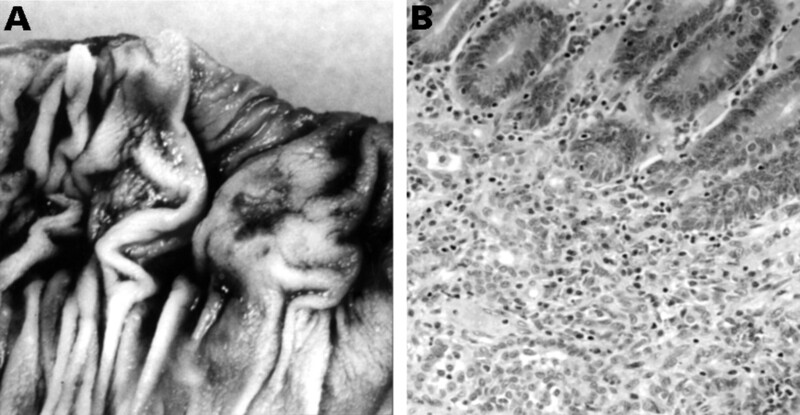 Histology of all the polyps disclosed identical submucosal neoplasms with a predominantly solid, but focally tubular, growth pattern (fig 1B), and not expressing epithelial mucin. Investigation with immunocytochemical markers showed that the intestinal polyps were deposits of malignant mesothelioma (the mesothelial markers thrombomodulin and HBME-1 were positive; carcinoembryonic antigen, AUA1 and chromogranin negative). (A) A sessile colonic polyp showing central ulceration. (B) A colonic polyp containing metastatic malignant mesothelioma resembling carcinoid tumour. The patient died in July 1997. At autopsy, the base of the left lung was found to be encased in a dense white tumour. Metastases were present in the ileum, colon, right chest wall, left kidney, and liver. Histology and immunocytochemistry showed that the primary lung tumour and metastases were the malignant mesothelioma. There was no known history of exposure to asbestos, and the patient did not have any fibrous pleural plaques. To the best of our knowledge, there has been only one previous report of a malignant pleural mesothelioma giving rise to multiple colonic polyps.1 Malignant mesotheliomas frequently display a solid and tubular growth pattern, which can make their distinction from adenocarcinomas and carcinoid tumours very difficult on morphological grounds alone. This case is a reminder that intestinal secondaries can be a source of bleeding and that such metastases can arise from malignant pleural mesotheliomas. (1997) Metastatic malignant mesothelioma presenting as colonic polyps. Hum Pathol 28:993–995.